Searching for some instant final expense quotes? Just fill out the quick quote tool on this page and you will see a list of real prices from multiple highly rated carriers in your state. As you are probably well aware, the cause of Crohn’s disease is completely unknown. What is known is how it will impact your eligibility when it comes to buying yourself some burial insurance protection. Over the years, we have successfully helped many Crohn’s patients obtain the peace of mind that a final expense policy affords. Having Crohn’s and getting burial insurance is actually quite simple, and we will show you just how affordable it can be. In this article, we will break down how insurance companies underwrite this condition, what you will qualify for, and how to find the best policy. As uncomfortable as Crohn’s Disease can make your life, it truly doesn’t have much of an impact when it comes to qualifying for a final expense life insurance plan. Outside of some rare circumstances (see the underwriting section below), you can easily get yourself burial insurance with Crohn’s Disease from virtually every burial insurance company. Furthermore, you will be eligible for a level death benefit. A level benefit offers you full instant protection, and the lowest rate offered by the carrier. Essentially, having Crohn’s Disease is just like not having it. That’s how much of a risk factor it is when buying final expense insurance. Going to the doctor is a way life when you have Crohn’s Disease given often you must go. We are pleased to inform you that when you apply for burial insurance, you won’t have to see a doctor. There is no medical exam, you don’t need to provide your doctor records, or do anything remotely inconvenient. All you will ever have to do is answer some basic questions about your health. That’s it. In most cases, we could receive an official approval within minutes of submitting your application. While Crohn’s Disease can often times be uncomfortable and painful, it won’t hamper your ability to acquire truly affordable burial insurance. In the eyes of the insurance companies, they view it as a total non risk factor. When it comes to burial insurance, the insurers will gather some basic data about you in order to determine if you qualify. They are going to employ two primary tactics to gather they information they need about your health to see if they will accept you or not. We’ll go through each one so you know how to each one will apply to your given your Crohn’s Disease. Honestly, the health questions on a burial insurance application are the primary and most governing source of health related information. The insurance companies rely on your answers to these questions more so than your medication history or your MIB file. If you ever say yes to any health question on a life insurance application, it will unequivocally mean a higher price. In addition, it could potentially mean a waiting before your benefits go into effect (varies by company). If a burial insurance application does not ask about a health condition, it means they are perfectly okay with it. To put it another way, they only care about the health issues they ask about on their application. Now you might be wondering, what’s the bottom line here? The reality is that, Crohn’s Disease is not a health condition you will see asked about on 98% of burial insurance applications. That means, these insurance companies don’t care about it! In most cases, getting burial insurance with health issues is generally not an issue. This is especially true when it comes to Crohn’s Disease. Because they don’t care that you have it, it makes you eligible for an immediate death benefit, and the lowest rate they offer (unless you have some other health issues that cause a problem). The second most significant source of information the insurance company will tap into about your health is your pharmacy report. Basically, they will look through all the medications that you have filled. They do this so they can get a sense for what types of conditions you are being treated for. Every life insurance company knows very well what illnesses prescriptions are meant to treat. When it comes to Crohn’s Disease, there are many different medications that you could have been given as treatment. In truth, most of them won’t cause any issues, but there are some that may. We’ll go through each one, so you know what to expect. These drugs themselves are absolutely no issue whatsoever for the vast majority of final expense companies. Drugs like Prednisone are quite common for a variety of health conditions Crohn’s Disease included. The only way these drugs could cause a potential issue would be from their side effects. Diabetes is the only side effect that may present a challenge depending on how bad your diabetes is if in fact you have it. You should know that, diabetes is very very rarely an issue when it comes to buying final expense life insurance. To get a full understanding of how burial insurance companies react to diabetes, check out our full diabetes article here. Just know, there’s a 90% chance diabetes will have no impact whatsoever (just like the Crohn’s Disease itself). You would have to have a really severe case of diabetes with multiple complications before it would begin to make it difficult to qualify for a final expense policy. The primary reason someone is given these drugs is to prevent an organ or tissue transplant rejection. It can also be used to treat Systemic Lupus. Finally, it can also be prescribed for various autoimmune diseases such as rheumatoid arthritis or Crohn’s Disease. Most carriers won’t assume you have had a transplant or that you have Lupus just because you are on this drug. They will very likely know that it was prescribed to treat some kind non threatening autoimmune disorder. The pictures below are from an underwriting guide for a major final expense company to illustrate what we are talking about. In the pictures above you can see the words “Rheumatoid Arthritis”. It’s is eligible for a level death benefit. That too is an autoimmune disease, and they look at Crohn’s in the same way. The reality is Mercaptopurine is overwhelmingly used to treat cancer. It’s for that reason that this drug will usually be hard coded by the insurers to view a Mercaptopurine user as a person with cancer (see pic below from an underwriting guide). Now as you can imagine, a life insurance company assuming you have cancer has huge implications. That’s kind of an understatement really. While many final expense companies will assume a person who filled a prescription for Mercaptopurine has cancer, it does not mean you have to accept that as your fate. For starters, 95% of burial insurance companies will only look back on cancer 2-3 years. If you took Mercaptopurine beyond 2-3 years ago, you are free and clear. It won’t be an issue at all. However, if you have filled a prescription for Mercaptopurine within the last 2 years, there is work to be done. Basically, we would need to get a letter from your doctor that states the Mercaptopurine was prescribed to treat your Crohn’s disease and not cancer. That letter will override their assumption that the drug was used to treat cancer. Please note: The letter is something we will do. You do not need to handle this. This is part of our job. 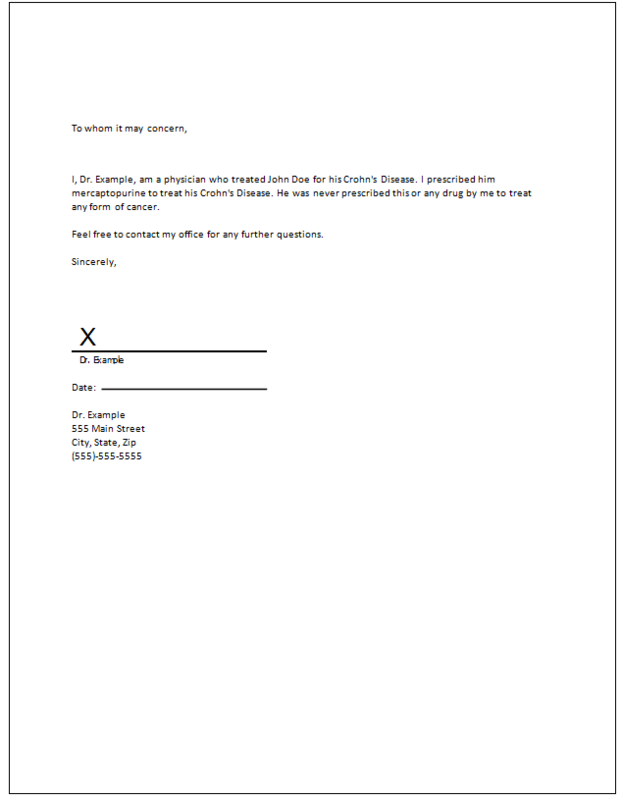 Essentially, have a letter just like the one below that we fax to your doctor. Generally, it takes a few days, but we get it back signed. Then we proceed with the application and submit it to the insurer. With the letter, they will approve you for a level death benefit rather than assuming you are/were a cancer patient. We have countless clients who can substantiate that. Good luck finding another agent or agency who will go that far to ensure you get the best deal possible. Most agencies would just write you up with a company that assumed you had cancer. That would mean substantially higher rates, and a full two year waiting period before your policy went into effect. While it’s not common for patients with Crohn’s Disease to get this drug, it can happen. In most cases, this drug is very temporary due it’s potentially serious side effects. This drug is typically used to prevent the rejection of an organ transplant. For this reason, if you have ever filled a prescription for this drug, most burial insurance companies will assume you’ve had an organ transplant. Having an organ transplant of any kind is a flat decline with all life insurance companies. If you have ever filled a prescription for this drug, we will unequivocally need to get a letter from your doctor. The letter will state that the Cyclosporine was meant for your Crohn’s Disease, and that you have never had or been recommended to have an organ or tissue transplant. We will get this letter for you. There is nothing that you will need to do. All we do is fax a letter to your doctor, and they fax it back. It usually only takes a few days. All Other Crohn’s Disease Medications. Anything else you may be prescribed like antibiotics, pain relievers, or any other drug that has not been discussed will not be an issue in any way. There simply is no scenario where the presence of any other Crohn’s Disease related drug will cause an issue. While the Crohn’s Disease itself is no issue, there could potentially be some associated risk factors that throw a wrench in the process. The good news is these are rarely an issue, and most of them are temporary. Do you have any surgeries, hospitalizations, or diagnostic tests that have not yet been started, completed, or for which results have not been received? Basically, they want to know if you have a surgery coming up. If you do, they want you to apply after the surgery is complete. Having a surgery of any kind is dangerous. They don’t want to insure that risk. People with Crohn’s Disease are no stranger to the operating room. If you have an upcoming surgery that is booked, you will need to wait until it’s done before you can apply. One side effect of Crohn’s Disease is weight loss. Thankfully, weight loss itself is a total non issue for 98% of final expense life insurance companies. However, there are a few companies that ask about unexplained weight loss greater than 10 pounds within the last year. Just watch out for companies that ask that sort of question. It may or may not apply to you (likely won’t). It’s just something to be aware of. People who have been diagnosed with Crohn’s Disease are at higher risk of developing colon cancer. If you developed colon cancer (or any form of cancer), it will greatly impact your eligibility for burial insurance. If this has happened to you, we highly suggest you read our in depth article about getting burial insurance with cancer. By now you are no doubt well aware of the fact that you can get qualified for an affordable burial policy in light of your Crohn’s Disease. Most carriers will absolutely accept you without reservation. The only question is which one will offer you the best deal? To find the best burial insurance with Crohn’s Disease, you absolutely must consult an independent final expense agency that represents lots of insurance companies. They will assess your situation and compare offers from all the companies they represent to get you the best deal. Most people think they can contact insurers directly and get better rates. This is false. The majority of insurance companies will not sell you their insurance directly. If you contact them, they will tell you to contact and agency. For the few life insurance companies that do sell directly to consumers, the rates are no different than if you had purchased through an agent. This is why it’s key you contact the right kind of agency. It’s so critical that the agency you work with can shop around from over 10 companies to ensure they get you the best deal. As mentioned in the medications section, there are some Crohn’s Disease drugs that can make it difficult to qualify. If you have taken any of those drugs, you must work with an agency like us that will go the extra mile to overcome those obstacles. We can confidently say that you likely won’t find another agency that is better equipped to help you find a funeral insurance plan when you have Crohn’s Disease. Not only do we have ample experience helping clients with this illness, we are more than willing to go the extra mile should we have to. In addition, we represent over 15 different burial insurance companies, so we can and will find you the best deal out there hands down.